You Know You Want This is a collection of short stories by Kristen Roupenian. I had so much fun reading these stories! Which is sort of a weird thing to say because they are all pretty dark. Some of the stories turn violent, and some of them involve magic or horror elements (although I’m dubious as to whether the horror elements are ‘real’ or just in some of the protagonists’ heads). 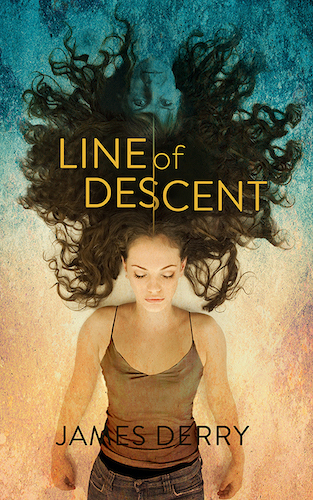 The stories are mostly about love and desire, and how we can twist ourselves up in what we see in ourselves and what we hope other people see in us. Does a fantastic job of getting into the head of her male characters. I think she’s spot-on with her characterization of males navigating their twenties and thirties. Maybe that says a lot about me. A lot of the male characters get caught in this loop of wanting to be the ‘nice guy,’ and they play into that, with alternating good and bad intentions. I guess ‘Cat Person’ is the big draw here, because it was published in The New Yorker and generated lots of buzz. It’s a good kind of character piece, about a ‘boy’ and a girl flirting and fluttering around each other on the months leading up to a very memorable first date. The tone of the story really drew me in, because isn’t sure of herself, she isn’t sure of this dude she’s interested in, and the whole story becomes a sort of mystery. Is this guy a sort of lovable loser? Or is he just a plain loser with some masochistic and mysognistic baggage? The way both characters seem to vacillate and question each other (and themselves) will probably seem very familiar to anyone thinking back on their early days of dating. The Good Guy follows similar themes, but over a longer period of time and from the male’s perspective. Reading these stories I could totally see Netflix or Hulu snapping up the rights to the whole collection and turning them into a series that would be sort of like a cross between You’re the Worst, ‘You,’ and the new Twilight Zone. ‘Look at Your Game, Girl’: Classic, coming-of-age creepy. ‘Sardines’: Excellent vignette of a bad mom and her worse daughter, with another truly skin-crawling ending. The Mirror, the Bucket, and the Old Thigh Bone: Psychoanalysis by way of a fairy tale. Cat Person: Again, kind of ambiguous throughout. Where are we going with this? Are we supposed to feel sorry for the narrator’s crush, or cringe at him? But then a slap-in-the-face finale that resolves the question pretty definitively. The Good Guy: Another excellent, if cringe-inducing, character study. The Boy in the Pool: Who doesn’t remember watching those late-night cheesy thrillers on Showtime or Cinemax? Scarred: Magical realism. Love how the main character sort of blithely takes on her role. The Matchbox Sign: Oof. Maybe I’m choosing to interpret this one in a way that wasn’t intended, but this one was depressing and unnerving in just the right way. Biter: A perfect sort of snarky, dark note to end on. This definitely put me in the mood for reading more great short stories. Here’s hoping I can find another collection as energizing as this one. Or that Roupenian will publish something else soon! By the way, my tentative title for the Groundbreakers third book is ‘Blades of the Demigod.’ My intent was to always finish the third book Groundbreaker book and then release all the books together in a box set. But halfway through ‘Blades,’ I decided it needed to be more of a conclusion to a trilogy, as opposed to simply the third in a series of interconnected adventures. 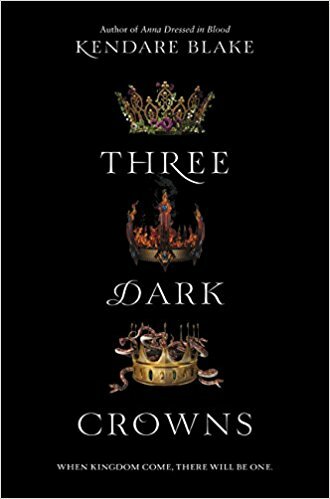 I thought the box set as a whole would be more satisfying to the reader if there was an underlying thread (or threat) that runs through all three books, which is then wrapped up in Book 3. That plot point was the Ancient Ones, which were introduced in Book 1, and which are a big presence in the first two books, always there as this incomprehensible, immense threat in the background. You see, it’s revealed in Book 1 that the villainous Issulthraqis want to reunite the Ancient Ones and used their combined powers to re-write the world. My first iteration of Book 3 was a sort of detour adventure, that veered away from the Issulthraqis plot. But I realized with a few minor adjustments, I could rework the plot to intro more stakes in the third and final story, and to help create closure for the three books as a whole. My original idea was to write six or seven Groundbreakers books, with the Ancient Ones threat always there in the background, but now, if I write a fourth book in the series, I can be completely free to take the story wherever I want. Or, if I move to something completely new, then at least the series has a bit of closure for now. Which brings me to my next chunk of big news! I’ve already started my next novel. Maybe not the smartest move, considering ‘Blades’ is still in first-draft mode—and also I need to do some post-publication tweaks to Books 1 and 2 to make the story cohesive—but I was too excited about my new idea to hold off! 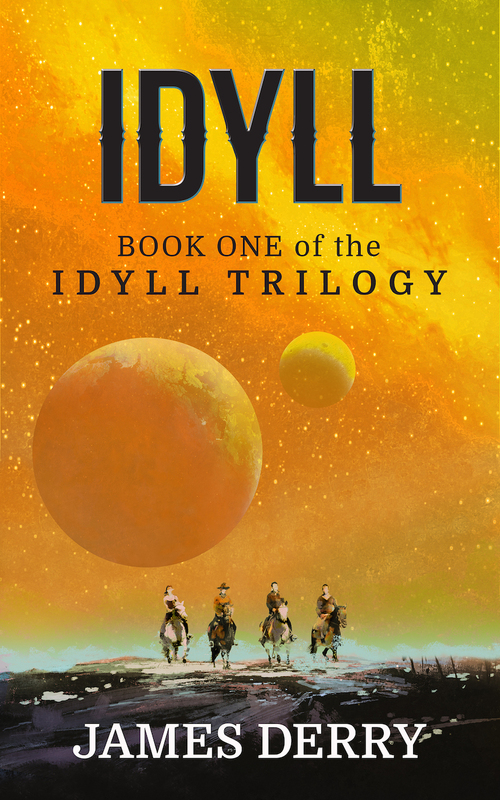 Fans of Idyll will be happy to know that I’m writing in science fiction again. This time, near-future sci-fi. The story is about what comes next, after iPhones and social media. What will it be like to live in a world with A.I.s and organic upgrades that make us smarter, prettier, and more long-lived. Of course, as in all sci-fi, the world is never as bright and as shiny as it seems. My working title for this new book is ‘The Fire and the Burned.’ My plan is for it to be a single, standalone novel. If I can finish it (working that third Groundbreakers book in the meantime, here and there) then I will have eight books in my oeuvre! Not quite Stephen King’s, but nothing to sneeze at either! Here’s to making it to double-digits one day! I’m moving along pretty well on my author projects this winter, but I’ve also been enjoying some shows, books, and games in my bits of free time. 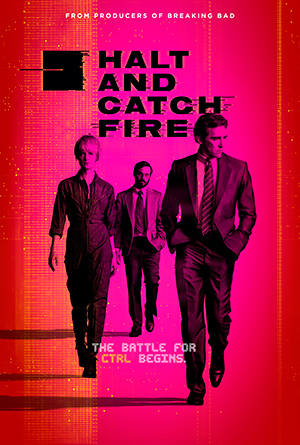 Today I want to talk about ‘Halt and Catch Fire,’ which I’ve been bingeing on Netflix over the last two months. It’s been awesome! It’s been a long time since I’ve looked forward to a show so much that I would shudder giddily before each new episode. Even now, just hearing the theme song kick in is enough to trigger Pavolvian glee. Over four seasons and forty epsiodes, the show follows four brilliant characters (4.5 if you count Toby Huss’s character!) through the personal-computing and networking boom of the 80s and early 90s. Each character brings different skill-sets and philosophies to several different startup ventures, and although the characters are fictional, we see them have a hand in several real-world advancements. I’m going to recap all four characters, but I’ll use the actor names, because the cast is absolutely awesome and they deserve as much name-recognition as possible. Lee Pace plays the entrepreneur of the group, he’s the iconoclast who brings people together and pushes them to disrupt their normal ways of doing things, although he’s criticized for never actually coming up with any ideas on his own. Mackenzie Davis is the genius programmer and game developer. Her weaknesses are that she can be ridiculously stubborn and idealistic. 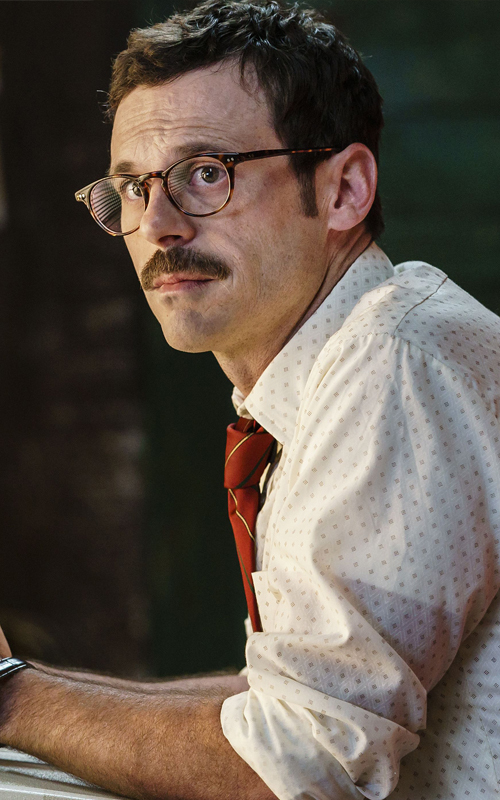 Scoot McNairy plays the engineer (the hardware guy) who is a married father of two. I think I related the most to him. His character flaw is that he can be manic (at home and at work). Finally, there’s Kerry BIshé, who plays the sleeper-hit best character on the show. She has a mix of I.T. and business skills, and she’s the voice of reason and backbone of several of the team’s endeavors. She’s can also be a lethal, c-suite cutthroat (to friends and foes) when she thinks that’s what’s required. The four main characters clash a lot—end up in out-and-out conflict, fall in love, fall out of love, reunite, separate—over the four seasons of the show, The character arcs and realistic conflicts in Halt and Catch Fire really make each season crackle with energy, even if there are no hitmen or gangsters anywhere in sight. Not to make this post any more geeky, but again and again I kept thinking that Marvel/Disney should hire the show’s creators, Christopher Cantwell and Christopher C. Rogers to reboot the Fantastic Four with the same sort of team and family conflicts that they bring to HACF. Hell, they could even use the same cast with some of the same character traits in place. Lee Pace is Mr. Fantastic. 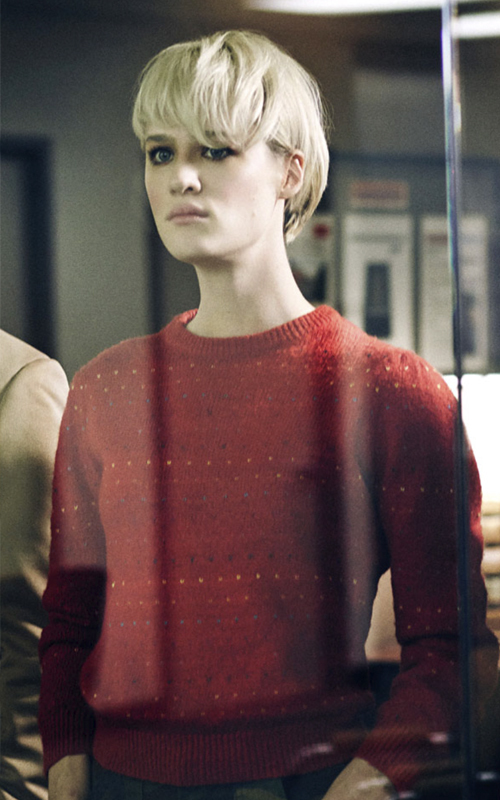 Mackenzie Davis could be an excellent gender-flipped version of the hot-headed Human Torch. Scoot McNairy is Ben Grimm and Kerry BIshé is the Invisible Woman. I looked it up, and it seems that the producers and writer of HACF knew that their fourth season would be their last, before they started it. Because of that, the creators had an entire ten episodes to build to a proper conclusion for the series. That gift of time and consideration really shows. If you working in the technology sector, or if you’re a fan of Mad Men or Silicon Valley, I’d say you should give Halt and Catch Fire a try! 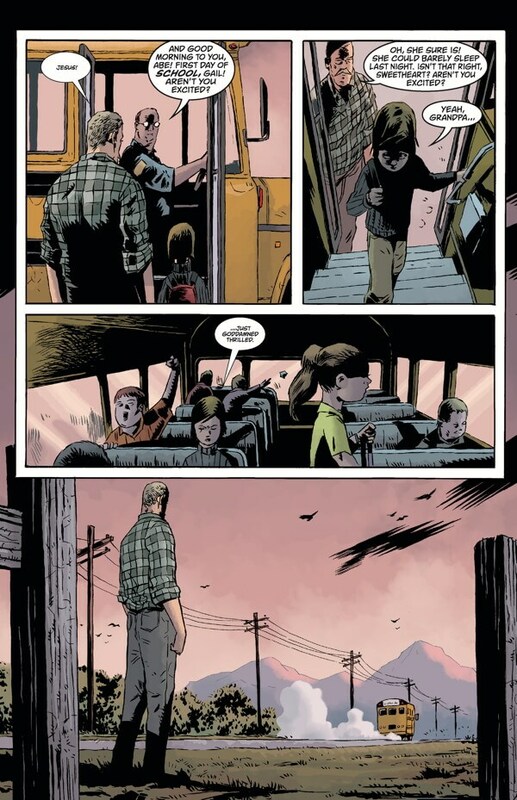 For casual readers of comics, a series like an ‘analog’ Black Hammer can be great. It’s a standalone story (no other back issues to track down, no Wikipedia pages to research) that features ‘analogs’ to well-known archetypal characters. Black Hammer is the latest analog universe that I’ve dived into. It was a memorable experience, although I have to say I wasn’t completely blown away. The story follows a collection of superheroes who find themselves trapped in some sort of pocket universe that resembles a tiny farming town. How did they get there? What is the force that kills them if they try to leave? Unfortunately, none of these questions are answered before the series went on indefinite hiatus in 2017. The best thing about the 13-issue series (so far?) are its character concepts. I’ll list a few of my favorites. Abraham Slam is an obvious Captain America analog, but he doesn’t have a super-soldier serum or the benefit of being frozen in ice to help him fight off ravages of time. 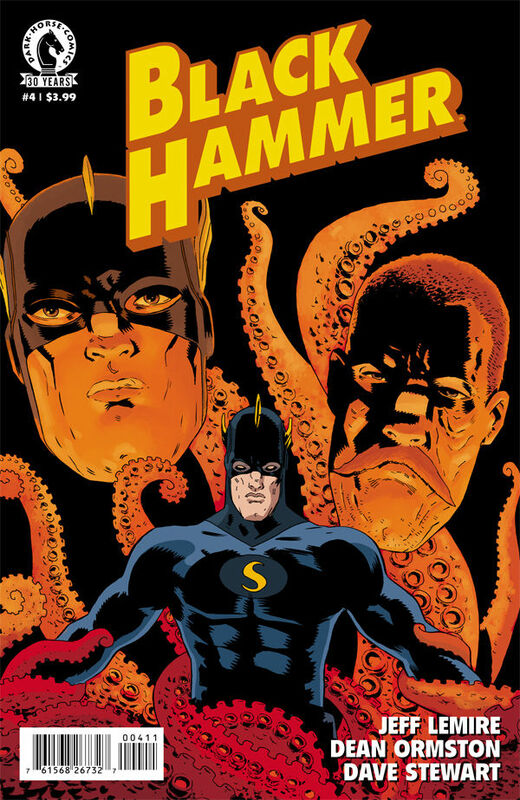 As the Black Hammer story begins, he’s already the oldest character and quite a bit over the hill. Golden Gail is sort of Shazam character in reverse. Shazam was an ordinary boy who turns into an adult superhero when he says a magic word. Gail is a normally aging woman who has become stuck in her eternally prepubescent, super-powered form. Talkie Walkie is a robot sidekick character with an awesome name and an even more awesome character design. 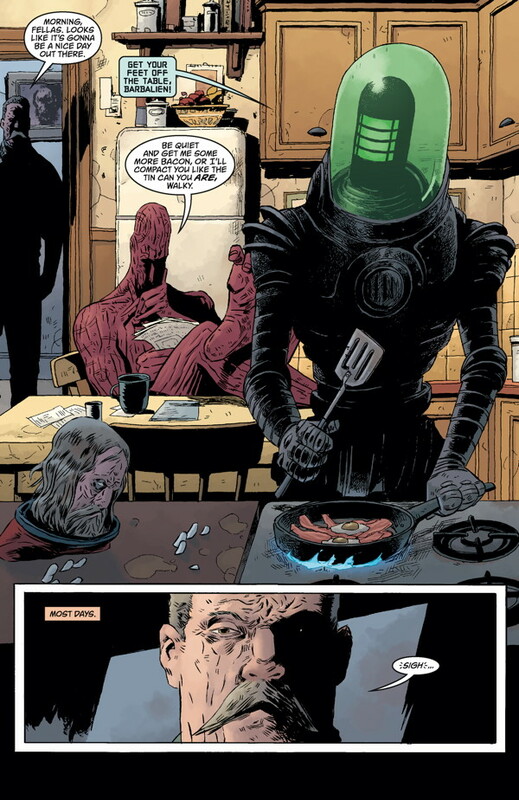 Black Hammer is a character who seemingly died trying to escape the pocket universe. At first he seems like a 70s-blaxploitation hybrid of Superman and John Henry, which cool enough. But later we learn that his origin veers toward Thor and Jack Kirby’s New Gods. The characters have a lot of potential, and the series has already spawned an excellently named spin-off, Sherlock Frankenstein. I was disappointed, however, that we didn’t get any kind of resolution for the main characters. In issue one, we find out that the heroes have been trapped in this bucolic setting for ten years. And yet it takes a newly introduced character to start showing them clues that might help them out of their predicament. If these are Earth’s greatest heroes, then why have they given up so easily on finding a way out? Also, Gail’s best friend is a gay team-member who doesn’t seem particularly closeted. And yet after ten years of living in close quarters, Gail is shocked to find out he’s gay? There are some plot points and character interactions that seem paper-thin. Maybe some of these troublesome issues could have been resolved if the characters had been trapped in the pocket dimension for one year instead of ten. Also, some of these issues seem to be exacerbated as the last three issues of the series seem to slow down and drag, plot wise. Dean Ormston’s rough-hewn art is charming and expressive, but there are some panels where his backgrounds and his faces seem a too flimsy for Black Hammer’s more horrific or cosmically-scaled scenes. For instance, when one character enters a Lovecraftian dimension of “unspeakable angles,” where a mortal man could go insane. The background of that scene simply shows sketchy alien eyeballs floating in space. With all that said, I truly did enjoy the series. It’s brimming full of cool characters. And some fun experiments in comics deconstruction. In one flashback, we see a Golden Gail adventure told through that overwrought tone of 60s comics. I already mention how Madame Dragonfly re-creates an EC Comics feel. Another story shows Abraham Slam take on an ‘Extreme’ 90s-era makeover. It’s moments like these—and some fantastic David Rubin fill-in issues—that I’ll remember most about the series. Here’s hoping one day we’ll get some answers about everything else. It’s been five months since I started Book 1 of my new fantasy series, and I’m currently making my way through a nearly-final edits. But at the same time, I’m working through the first draft of Book 2! Way back in 2014 I posted about my method for ‘gap-writing’ a first draft. But with these two books, I’ve been experimenting with dictating the draft into my phone. I’ve been hearing more and more about the pros and cons of dictating technology. I don’t really do anything special with. I just turn on my ‘Notes’ app and click the mic button. There’s LOTS of correcting afterward, but I think it’s worth it to be able to freely record my ideas and lines while I’m feeling creative. I’ve been enjoying so much, that during a recent weekend trip to Jekyll Island, I spent a good deal of time roaming the beach and dictating passages into my phone. I’m sure any other beach-goers thought I was a little silly. Or a workaholic using his phone to take care of business on the beach. And they were probably right. Jekyll suffered some damage from Hurricane Irma this September. It barreled through and scraped some of the sand from the beach, took out at least one boardwalk, and excavated another old one. (See the pic below.) The weather was a bit overcast, so overall, it made for a bit of a post-apocalyptic feel (if you happened to be in a particularly imaginative frame of mind). Which leads me to one other ‘pro’ to dictating: It unshackles you from writing in your office or your living room. Getting into a wide open space and doing some storytelling in a natural setting was really fun, and it really got my creative juices flowing!